The Moon is void all day, suggesting that it’s probably best to work on in-progress projects rather than begin something entirely new. Even so, we have excellent energy with us for focusing on what truly matters to us, as well as for harnessing the energy of desire and make it work for us or others. 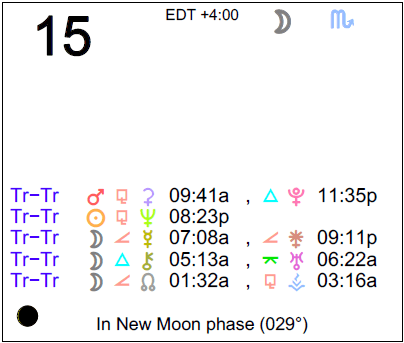 The Moon is in Scorpio all day (until Friday, October 16th, at 5:18 AM). The Moon is void all day (until tomorrow at 5:18 AM). 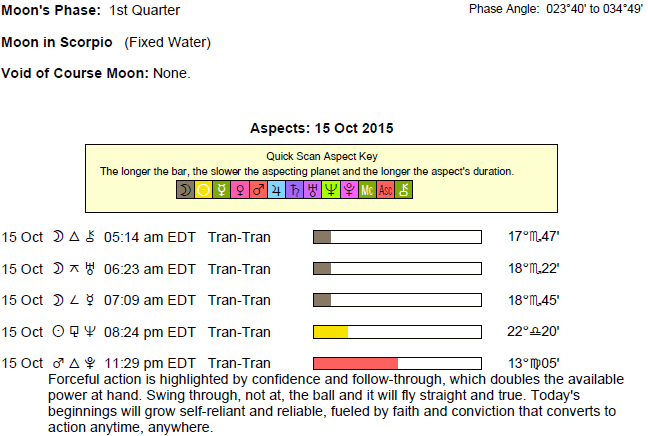 A New Moon occurred on the 12th, and a First Quarter Moon will occur on October 20th. There can be a serious tone to the day, dear Aries, in a good way, as you’re more able to direct your energy into truly worthwhile pursuits. Perhaps you get something done well before a deadline, or work ahead on a project that has long-term potential. Bringing a little more order to your projects or environment can really pay off now, and thinking about your overarching goals can help you to recognize priorities. You can get a lot done today, particularly if you are involved in research and analysis or number work. It’s a good time to revive old projects or to fine-tune current ones. You are approaching the world with a healthy level of entitlement, and there can be information coming in or observations made that benefit you. There can be some important conversations today, dear Taurus, and a practical outlook. It’s a good time to apply yourself to an important project, to lay down ground rules with the family, or to handle important errands. As well, good energy is with you for travel, love, fortune, and creative projects. Romance could reach a new level, or feelings deepen for someone. Broadening your viewpoint or beliefs can be part of the picture now, particularly through others’ eyes. There could be help coming from relatives and possibly in-laws or extended family, or improved relationships. Your stronger focus and confidence can be used to better yourself and your relationships, as well as special projects. Some of you could be publishing creative works and ideas quite successfully now. This is a strong day for applying yourself to work or to a health routine, dear Gemini, and to get various important chores and errands done. There is a chance to resolve a problem related to power dynamics or jealousies and possessiveness in a relationship, as you’re especially focused on making improvements and aware of how these problems can undermine your relationships. You have inner, emotional courage at your disposal. Relating is complicated now, but rich and open to change and improvement. With a lot of power in your sectors of emotions and inner world these days, and much of it transformational, you are in a strong position to improve relationships with others and with yourself. You are learning a little more self-reliance, which in fact contributes to healthier relationships with others. There can be a mystery to solve or a problem resolved now. Creative efforts today can be productive, dear Cancer. You’re inclined to take things quite seriously, in a good way! In fact, this is a good time to sort out priorities. The ability to influence a friend or partner is stronger than usual right now, and a relationship might raise to a new level with bonding done now. You have greater insights into problems, and particularly relationship matters. There can be the need, and power, to help and support someone, or to benefit from someone’s wisdom yourself. There is a lot of power in your communications and relationship sectors this week, and this can be felt as building motivation to connect with others and to connect with your own interests and paths of learning and sharing. More understanding, attention, and insight can help give a nice boost to relationships. You are learning more about the world around you, and someone may be integral in encouraging you to step just a little outside of your comfort zone in order to learn even more. Today is strong for discipline around the home and self-discipline as well, dear Leo. Your talents might be recognized, or you could be working on something that feels especially “right” to you. You may very well discover ways to improve finances now and this week. With Mars in your resources and natural talents sector these days, you may be especially gung-ho about new projects and ideas to make money or to make good use of your talents and resources. However, Mars can sometimes push too hard or fast, but today, you have Pluto helping you temper this energy and reminding you to have a plan. This doesn’t have to be a strict plan, but one that encourages some routine. This is a fine time for handling details, research, improving methods, and throwing yourself into work or tasks that excite you. It’s very easy for you to get caught up in a project now. “Fun” to you now may very well be tackling a project that is both creative and practical. You can accomplish much today, dear Virgo, particularly when it comes to studies, errands, creative pursuits, and communications. Once you’re motivated, you can really throw yourself into something productive now. This is a time for thinking in bigger terms than you usually do. It’s important that you avoid hiding your creative side. In fact, these days you’re learning important lessons about being yourself, and confidently so. You might even feel a little tired of hiding your light. With Mars in your sign and in harmony with Pluto, your ability to take the lead, influence, and persuade is augmented. Your power to persuade, to lead, and to influence are strong right now. With others, and especially a child or a romantic partner or love interest (fifth house-ruled), you have special abilities to make a deeper connection, to break ground in a relationship, or to uncover important new information. Think in terms of self-improvement as well, as you can move mountains at the moment, especially when it comes to how you present yourself to others. Feedback may not be all wonderful, but you’re in the position to pull yourself up and learn. The need to get serious about an important personal belonging, finances, or possibly even a personal value figures strongly, dear Libra. Your more intimate relationships can be strengthened now through shows of support. You’re seeing areas where improvement is vital, but instead of seeing this as discouraging, you are especially willing to take on the challenge. Look for ways to strengthen family life or relationships with people who are family or like family to you. You could be seeing ways to improve your connection to your roots and to better express who you truly are through the actions you take, and especially about what you are putting behind you. Realigning your goals may be in order so that they reflect inner changes. There can be a need to help someone out or come to a person’s aid today, and this can be both challenging and satisfying. You are especially willing to find ways to cut out the fluff now, and have an almost uncanny ability to see through to the truth of a matter. Use your insight to help others or yourself. Your powers of observation are tremendous in general, dear Scorpio, but today, they’re put to especially good use. New insight might come in a friendship or with a project or plan. It’s not an ideal day for new launches, but it’s strong for working on in-progress projects and for developing existing friendships and connections. It’s also very strong for seeing what has to go in order for you to feel more powerful and effective. Perhaps you are now seeing where you’ve been wasting too much time, for example. This becomes clear and you can make plans to change your focus. Relationship matters can thrive and others tend to support your ideas, and possibly even be in awe of your insights. Information you need seems to emerge now, or you can put your observations to good use. You could become aware of an admirer now. Your enthusiasm these days is strong, dear Sagittarius, but at times, you may not know where to direct excess energy or where to begin. Today, channels for expression and for your passions are likely to become clearer. You might recognize that you’re best off with a plan, schedule, or strategy. You are not always thrilled to go along with a script or routine, but this doesn’t have to be a strict plan – just a few notes and goals that will help you to make better use of your time. You may want to do something especially meaningful with a business, your talents, or your resources. Focus should be on existing projects that need new life or refinement or plans for future ones, not for actual launches, as the Moon is void all day and this can mean all-new projects may never take off if they are begun today. You are drawn to, and have good instincts for, those things that are valuable and long-term. Pull out an old project or cherished possession and work on improving it if you don’t already have something that fuels your passions. Strong energy is with you for promotional activities, dear Capricorn, and possibly attracting people into your life who expand your worldview, personal horizons, or help you to learn and grow. Even so, you can also experience a stronger drive towards being more self-reliant. There can be a focus on friends, group associations, or long-term goals with an eye for what needs to improve or change. You are really commanding attention now, and you tend to have more personal influence than usual, so of course, this needs to be handled carefully. There is good energy for competitions – sports, beating high scores, business endeavors, and the like. Changes on the inside may be reflected in your actions now. Your powers of attraction are intense today! Cultivate, improve, enhance, and support the relationships you have. There is both reverence for the past and the desire to improve today, dear Aquarius, and this suits your personality very well. You’re seeing situations, things, projects, and relationships for what is truly working and what elements need to improve or go. In this way, there can be opportunities to make peace with your past in some way now, and also for strengthening your commitment to a path or a person! Intensity of feeling is likely but can lead to greater satisfaction. This is a fine time for some of you to discover information that is valuable, or to find a lost object. With so much energy currently activating the areas of your chart that rule your feelings and inner world, and wonderful support, you have the chance to really get in touch with what’s most important to you, inner desires and needs, and with your intuition. New insight into dilemmas of an emotional nature could come now. Observe, research, and reflect now. You are communicating with more confidence and focus right now, dear Pisces, and others are drawn to you for your advice or insight. You might be forming or enhancing important relationships these days, and your passion and loyalty are attracting others. It’s a good time to get to the core of a matter or problem, and for new information to surface about old matters. Circumstances are such that you’re in the position to make plans and devise strategies, particularly in terms of your life direction, purpose, and happiness goals, which are changing as inner changes occur. You are bringing special things to any group or team setting now, and people are drawn to you and follow your lead. You also have the power to learn from any conflicts arising in friendships or partnership. You may be finding more meaning in your relationships now, and this is satisfying. If Your Birthday is October 15th, If Today is Your Birthday full horoscope here. Moon 05° Capricorn 50' 48"
Mercury 09° Aries 36' 00"
Venus 04° Aries 31' 55"
Mars 15° Gemini 53' 24"